Dinner is served! 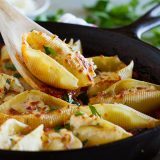 These Stuffed Pasta Shells with Easy Bolognese Sauce look like they take a lot of time and effort, but the recipe comes together quickly enough for a weeknight dinner! Bring a large pot of water to a boil. Salt generously, then add the pasta and cook according to the package directions. Before draining the pasta, reserve 1 1/2 cups of the starchy pasta water. Drain. Meanwhile, heat the olive oil in a large oven-proof skillet over medium-high heat. Add the ground beef and cook, breaking it up as it browns, about 5 minutes. Add the garlic and cook until fragrant, about 30 seconds. Reduce the heat to medium and add the crushed tomatoes and tomato paste, as well as 1 cup of the reserved pasta water. Season with salt and pepper, and allow the sauce to simmer for 5 minutes. If the sauce thickens up too much, add more of the cooking water. Stir in the spinach and cook just until wilted. While the sauce is simmering, combine the ricotta, roasted red peppers, egg white, 2 tablespoons of the parsley and 3 tablespoons of the mozzarella in a bowl. Scoop about 1 tablespoon of the filling into each of the cooked shells. ** Arrange the shells in the skillet with the sauce, open side up. Sprinkle the remaining 2 tablespoons of mozzarella over the top. Turn the oven on to broil, and place the skillet in the oven under the broiler until the cheese is browned and bubbly, 5-10 minutes***. (Watch this carefully, as each oven is very different.) Top with the remaining 1 tablespoon of parsley and serve. *If you are using a nonstick skillet, you can probably skip the olive oil. **I thought it was easiest to use a 1 tablespoon sized scoop to fill the shells. ***I kept my oven rack right in the middle of the oven and broiled for about 10 minutes to give some extra time to heat the filling through and cook the eggs. If your rack is near the top of your oven, it will brown faster on the top. Either way, keep an eye on it, as the broiler does its work quickly and you don’t want to burn your dinner!